As a self-confessed bookworm, one of the things I wished for when I was pregnant was for my little one to love reading books too. So I religiously read to my then-infant anything from fairy tales to famous children’s stories. When my baby boy turned six months old, I bought him some cloth and board books. But as expected, he had more appreciation for those with photos, drawings and colourful images than the ones with letters. That’s normal. 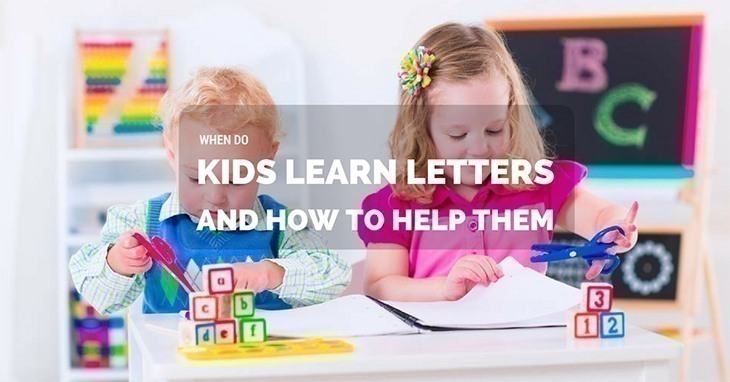 And I know all of you are wondering as well: when do kids learn letters? When do they even start to recognise them? Right now, you should also visit this article about other milestone in the development of children as: when should babies start playing with toys? They may reach the books and flip the pages. But do not expect them to get all excited about reading yet. What will interest them are the pictures. One of my baby’s first books contains letters and photos (A is for Apple, B is for Banana). They may not immediately grasp what they're reading, but they'll imitate how you sound when you read them. Recommended Materials: Cloth books with different textures (some may even come with music), board books with a variety of colourful visuals, and lullabies. I find this a very exciting phase. Why? At this age, my little boy can already recite some letters in the alphabet (A-D and X-Z). He learned it mostly from alphabet songs and of course, from our reading sessions. He can also recognise the images he sees (Elephant, Flower, Dog, Cat). And yes, he started scribbling and playing with crayons (if you’re going to buy, choose Crayola Twistables - it's encased in plastic so it won't break). These are the usual milestones for kids 2-3 years old. They might even pretend to read books even though it’s upside down! Still, continue reading to them especially during bedtime. It’s the stage where they will begin recognising the letters so you must be there to reinforce the learning and encourage them. Overall, it can contribute to their intellectual and mental development. Recommended Materials: Short stories, rhyming poems, and children’s books. Right now, they can’t just recite the alphabet, but they’ll likely sing it to you. They may already have a favourite book and will enjoy reading and re-telling it. Regarding writing, their scribbles may start to look decipherable, legible or at least resemble letters. But don’t expect too much, the best you can do at this point is to facilitate learning and keep on encouraging them. Also, they may now approximately name 5-10 letters although they could still get confused with those that look a little alike. Recommended Materials: Activity books, children’s books with fairy tales and stories, rhyming poems and songs. Finally, they can correctly recognise and write some of the letters of the alphabet although maybe not all. But 12-15 of them is already good enough mind you. They can match the sound of the letters (A is [ei], and B is [bi]). And another bonus here is, they can now say their names out loud and may even write them down! 1. Aside from nursery rhymes and songs, which you can start as early as a few months, keep nurturing their book appreciation by making reading a habit. They may want you to read the same story for months on end and will likely have questions after. Don’t forget to read alphabet books and when you see them trying to write letters, help them especially when they’re already scribbling their name. 2. Read aloud. It’s the first step to learning. What I usually do is run my finger through the words as I recite them. It makes him aware that I’m not only making things up but that we are READING. And another thing I like to try to keep his attention (trust me, he would just flip the pages endlessly at the beginning) is to change my tone of voice when I’m saying some other character’s lines. It's more fun and exciting to him – a lot like watching a movie filled with suspense. 3. Make it a fun time for him. I never want to be too uptight when it comes to learning. I want him to love books as much as I do, and I can't accomplish that by being too strict when it comes to reading. Don’t grill your kids if they're having difficulty pronouncing or they're not yet that interested in sitting down with you to listen to a story. The last thing you want is for them to view reading time as a punishment, not a pleasant activity. They have to enjoy it, and that can reinforce both their good habits and skills. If they don't like reading for long periods of time, then settle for a few minutes per day. It’s better than nothing. 4. Monkey see, monkey do. If they can tell that you don’t like reading, they’ll pick up on that. If they see that you’re excited about flipping the pages and telling stories, they’ll channel the same enthusiasm. Mothers are their children’s first teachers. If there’s anything I learned thus far, it’s that we shouldn’t rush or force anything when it comes to our babies. They will reach milestones at their pace, and the only thing we can do is guide and help them. Never push them too hard, instead, encourage and commend. Let them enjoy the learning process.